In response to this within NHS Scotland, newly qualified nurses are provided with the opportunity to apply for the Early Clinical Careers Fellowship which was developed by NHS Education for Scotland and funded by the Scottish Government in order to enhance leadership skills and ultimately, have a positive impact on the care provided to patients. So, when the opportunity arose to apply for the ECCF, I grabbed the challenge with both hands! Admittedly, the application process for this was one of the most challenging things I have volunteered to put myself through, but the opportunity to be involved in such a fantastic initiative at an early stage of my career was too great to miss! Okay, so what did this entail? First of all, completion of a written application, then a psychometric assessment – both language and numerical! – And finally an interview. It was a rigorous process however, I feel this reflects the importance of the ECCF programme. My journey of becoming a fellow began in 2012 and even in this short space of time, there have been many opportunities afforded to me and subsequently has allowed me to expand my support networks and working relationships both within my clinical area and outwith. Attending master classes, undertaking masters level study, participating in Action Learning Sets (ALS) while being supported by an identified clinical mentor/coach is all part of the fellowship experience. Although all have been new (sometimes daunting!) experiences, one which did induce some fear was that of ALS – what were they really all about? How does it positively impact on personal and professional development from an “ALS newbie” perspective? ALS are closely based on the model by Scrase (2013) which highlights the key factors involved. Currently, I have had the opportunity to attend and participate in several ALS with my ECCF peers and now feel more comfortable with the process. In the beginning, it felt somewhat bizarre to be the person presenting an overview of an issue but also in being part of the team who could only ask non-leading questions and certainly could not provide a solution to said issue, worry or concern! It was evident in adopting this process, that there are significant benefits to all participants in the set. 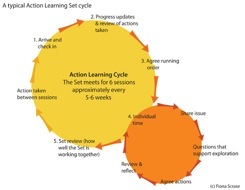 It is based on the principle of learning through action and by enhancing critical and reflective skills, enables change in both a personal level and organisational thus, promotes a better service for patients. I have found that ALS provided me with the opportunity to reflect in an open, safe and confidential environment.Through questions asked by my peers, it has encouraged me to challenge my thinking about particular issues raised in a supportive way, identifying a resolution almost in a “light bulb” moment! Furthermore, I was given the confidence to identify and execute goals established during the ALS – all with the common aim of enhancing my practice as a nurse. On a more interpersonal level, the ALS allows for one to enhance existing communication skills along with the skills of working effectively within a group. Being part of the Early Clinical Careers Fellowship is an exciting opportunity and one year in, I already feel is a fulfilling process, one which through access to ALS and the other key components is allowing me to continually develop and adapt to the ever changing role of a nurse within NHS Ayrshire and Arran. I know that my fellow ECCF peers would agree that we strive to be better, to improve and enhance person-centred care – ECCF and the linked support networks help, inspire and direct us in this journey. Next week sees the start of AHP month on Ayrshirehealth, with every blog coming from an Allied Health Professional – @aileenahpmh leads us off on 3rd July with “Life is like a box of chocolates”.